Many scholars and teachers of the Bible in the medieval period know that a general introduction to the subject is hard to find. There is, of course, the monumental Cambridge History of the Bible (volume 2), as well Beryl Smalley’s The Study of the Bible in the Middle Ages, which remains a landmark, thought it focuses mainly on the twelfth through thirteenth centuries. The more recent release of The New Cambridge History of the Bible (volume 2) has presented a helpful update, though the older volume continues to be valuable. Still, the question remained: What might we turn to for a shorter, general, single-volume introduction to the subject that would be accessible to non-specialists–the type of book that could be assigned in an undergraduate class? Frans van Liere provides one answer with An Introduction to the Medieval Bible (Cambridge, 2014). What I like about van Liere’s writing is his ability to present a general picture of the subject, but with the nuances of specific examples. In this way, while at times he zooms out to present a big picture, he also complicates generalizations by zooming in on specific cases of interest. It should be noted, of course (as van Liere acknowledges), that his task is helped by a focus on the Christian Bible in medieval Western Europe, with only glances toward Jewish and Eastern traditions. Van Liere’s ability to distill a large amount of content into accessible presentation without oversimplification is reflected in the organization of the material, which I liked the more I read. The book consists of a thematic structure–in contrast with chronological histories, such as those mentioned above–concentrating on four main areas: the Bible as material object, the Bible as a written text, the history of biblical interpretation, and the influence of the Bible on culture. Such organization leads to the interweaving of content, with individual sections building to a cohesive whole as one reads. Rather than being overly repetitive, however, when topics are revisited in different chapters, the multiple perspectives provide different purposes of examination. Being a bit nit-picky, I found that, unfortunately, a number of typos and editorial mistakes distract from the content. More generally, and more personally, I also would have enjoyed more pictures to illustrate the content–as I read, I kept hoping for more throughout the whole book–especially since those that are included are reproduced in good quality (despite being in black and white). Yet these are quibbles, and I offer them not to censure the value of the book but to present a balanced critique. Overall, this book will well serve those asking the question I posed at the beginning of this review. This is not surprising, given van Liere’s previous scholarship, including a number of articles on medieval biblical exegesis (one as a contribution to The New Cambridge History of the Bible), editions of commentaries by Andrew of St. Victor, and a co-edited collection of medieval primary sources titled Interpretation of Scripture: Theory (with another slated for release in 2015). It is clear that all of this was brought to bear in his writing of An Introduction to the Medieval Bible, which will certainly invite readers to the field. Why do you think that the St Gall miniature shows John and not Matthew? Thanks for the question! 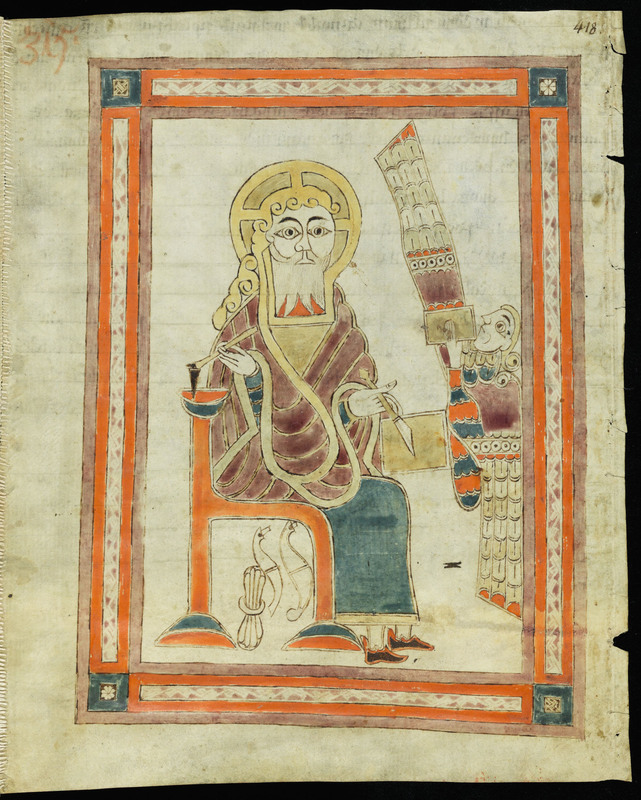 I was following Scherrer’s description with an identification of John writing the Apocalypse (though he is uncertain), as on the e-codices website; but after going back to the site I see that the “Manuscript Summary” identifies it as Matthew because of the accompanying iconographic emblems. I think both could use further justification and discussion.